We took the coolest eco-adventure Saturday! Lamanai is a Mayan Ruin first inhabited in 1500 BC! And continuously occupied for over 3000 years. There are over 700 Mayan structures in Lamanai with only a precious few structures recovered from the jungle - the rest are still concealed by overgrown rainforest & jungle growth. Lamanai was once one of Belize's more important Mayan ceremonial centers & is located on 28 miles New River Lagoon - easy access via converging rivers made Lamanai one of the biggest in the Mayan world, but it's also one of the least excavated. Left San Pedro at 7 AM, traveled by 35' open runabout-kind of like a big open parasail boat powered by two twin 150's-ZOOM! We traveled across to the mainland (and blew an engine so the trip back was much different-we were planing across this big mud flats-had to plane, otherwise the boat couldn't get through, only about 18" of water-we were almost across when one of the twins blew-OOPs, now we can't get out, but that's a problem for later in the day). We landed at a tiny village of Bomba, took a blue schoolbus over primarily dirt/rock roads tothe highway & New River landing. Bomba has no electricity or running water & a population of 80! While on the bus ride, one of the naturalists with us spotted a rare jabiru stork-they stand as tall as a man & have a wingspan of up to 14 feet! The largest stork in the world & we also saw it fly away! Unbelievable-there are only 300 jabiru's left in the world, it's an endangered species. Then we boarded a riverboat-long thin launch with a 150 outboard on the back-our group of 10 grew to 14 & this Mayan river guide took us on a sometimes dizzying spin up the river 26 miles! continuously occupied Mayan kingdom. There were only 6 or 8 buildings excavated out of hundreds. They ran out of funding to continue excavation & the estimate to bring Lamanai to mostly excavated is 50 BILLION dollars US. So our guides aren't expecting it to happen soon! became almost an amusement park ride as our Mayan pilot spun us through the 90 degree turns of this ancient meandering river. When we finally arrived back at Bomba, we split into two groups so the big boat would be light enough to plane over the mud flats with only one engine. Yikes! It didn't look this high from the bottom! The narrow steps made the rope much appreciated! Home Again ... Thank Goodness! David & I got to ride in a traditional Mayan panga fishing boat with an ancient Mayan fisherman! 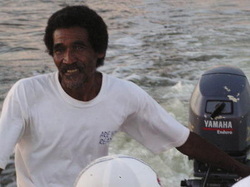 It was really a thrill & the old guy just smiled & smiled at all of us-I don't think he spoke any english, just his mayan dialect.Here'sour Mayan fisherman transporting us back to San Pedro -- 25 HP Yamaha & 8 of us in his little panga! It was after dark when we arrived back to the anchorage and we were very relieved to see WInterlude hanging out in the same spot - the San Pedro anchorage has thin sand over hard coral, not the most secure anchorage - plus gazillions of dive and fishing boats rolling us around constantly!